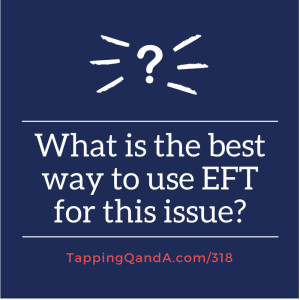 Pod #318: What is the best way to use EFT for this issue? I often hear from frustrated clients because they have tapped for an issue, but they haven't made any progress. When this happens they question whether tapping can help. The reality is that in many of these cases the issue isn’t whether tapping will work, but instead what is the best way to tap for an issue. This week I have for you a simple four-step process to ensure you are tapping in the most effective way to get to the root cause of an issue.